Last week I talked about Gracie losing interest in her feather. She’s still playful. She found something else. 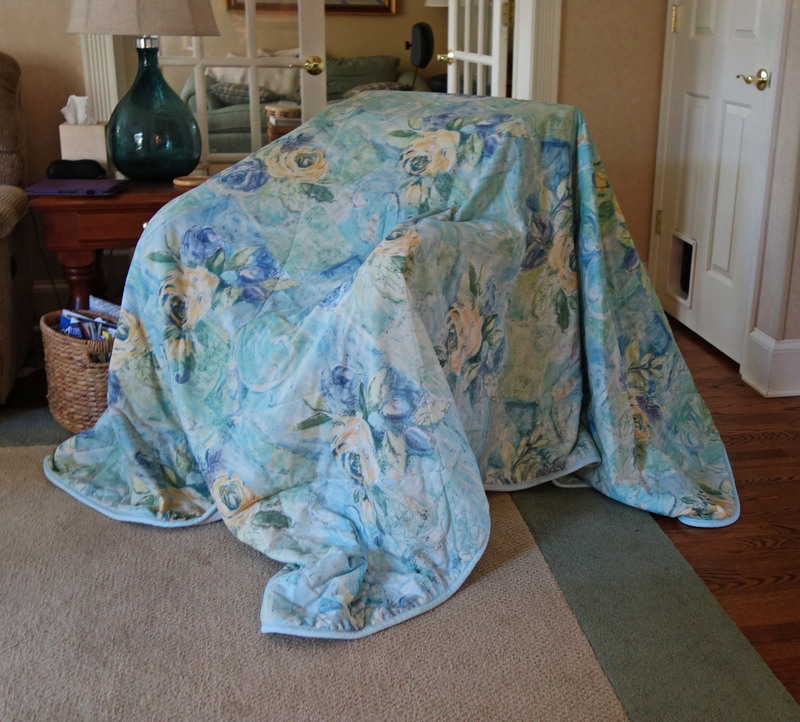 To finish off drying a bedspread, I threw it over a chair in the family room. Before you know it, it looked like this. 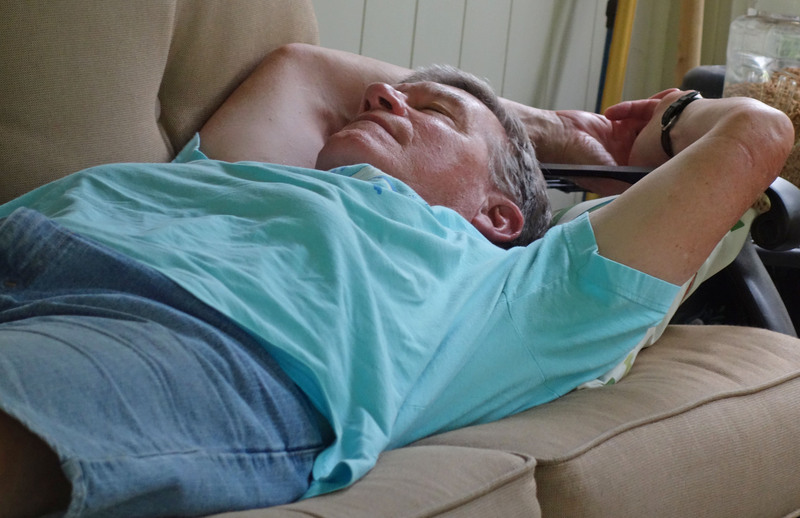 The beloved husband taking a snooze. We all hope you get a chance to play and take a snooze this weekend! This entry was posted in For Animal Lovers Only, Life at Home, Sassy cats and tagged animals, beloved husband, cat pictures, Gracie, Mollie, pets, porch fun by Kate Crimmins. Bookmark the permalink. I wonder if Gracie was undercover hatching up a round of mischief! I have enjoyed a long weekend, but somehow I just never get that nap in! 🙂 I am always glad for those who do. My cats are covering for you! Naps galore. Who can resist a good fort – or a nap? not me!! I wanted to climb in there with her! Looks like a good afternoon! 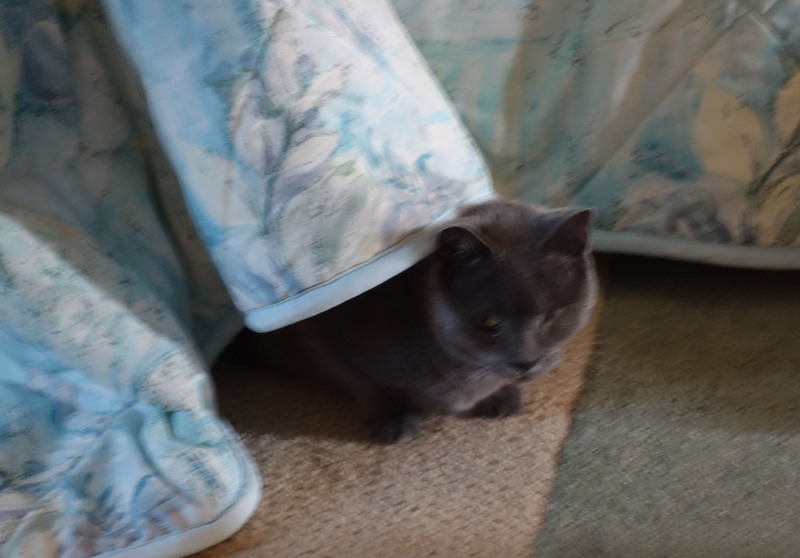 I’m not surprise Gracie found that irresistible – play fort! She’s just like a kid. Throw something over and chair and she’s under it. Hope your weekend is a good one!! Yes, they smell and stalk and check it out! Gracie was protecting us from non-existing woolly beasts! Gotta love her! I put a shabby chic cover over my grandmother’s chair to keep the cats from clawing it. Now they play “ambush the ankles at 5 AM” from beneath its folds. Yes! That’s a great game that always ends up with blood drawn. Human blood. Great picture of Mollie! A nap on a porch is pure bliss. I always plan on a short nap every day, doesn’t always happen but when it does it’s lovely. That first picture makes me giggle, of course Gracie loved it! Enjoy your weekend Kate! Gracie is still a kitten at heart. She is also most likely to get into some trouble daily! A good nap is wonderful. Especially when things have been busy. I didn’t nap this week but I got tired early. I found myself going to bed an hour earlier. Sleep gets it’s share. If you don’t nap it pulls you in earlier. My husband is a champion napper. I haven’t learned the skill… my mind makes me get up and do stuff. Enjoy your weekend (although the concept of a “weekend” really no longer applies, right?). During the winter I am a champion napper. Summers have so dang much stuff going on. I’m lucky if I get 20 minutes every once in a while. Nothing like a little nap to perk you up and get through the day. For years I wore contact lenses (the hard ones), so a nap meant taking them out and putting them back in again – so I never took naps. Now I wear glasses … no problem. I always take naps over 4th of July weekend as our neighbors start with fireworks at Memorial Day and all the way up to the 4th of July every single night and past curfew hours. I took naps with my hard contact lenses (not a good idea but I was much younger). They now make lenses that offer both near and far vision and I’m considering. I hate glasses and not just for vanity reasons. They slide down my nose and the ear piece on the side of my head always gives me a sore spot. I don’t need correction for distance but I also don’t like carrying readers around. Easier to wear glasses. I switched to glasses when I started working from home as I figured I was not getting dressed up for work anymore so went back to glasses. I hate them too … sliding down my nose and I am afraid to adjust the earpiece because they will sit crooked on my ear then. I know the comfort of contact lenses and it beckons me back. I wore the hard lenses for years, but all of a sudden couldn’t see as clearly. I always went to a contact lens practitioner who was associated with the eye doctor. He tried readers and they were useless and went through many pair to try to see. He told me not to get the bifocal contacts (as they move around in your eye and you have irregular vision), but to go with “monovision” and that is what I needed … to have near and far vision. So I had one lens for far; one for near vision. Worked like a charm! I still wore the hard lenses but they were the Boston Rigid Gas Permeable lenses which had minute slits in them so your eyes can breathe. I know people with soft lenses who leave them in 24/7 for long periods of time. I would be reluctant to do that. I am thinking of going back to contact lenses because the price of glasses is outrageous … I have progressive lenses, and beveled very thin as I have poor vision – otherwise the glass would be thick, and I got some type of coating not for glare (like I had before) but to eliminate the blue rays from the computer screen. I don’t see a difference in the two months I’ve had them though. 35 years of gas permeable for me before I went to glasses. 37 for me (1973 to 2010) and when I first got contacts, my father told me I could not drive in them in case one fell out. They bought the car when I graduated high school as I was starting college in the Fall and I was on my father’s insurance. I told him that removing the contacts made me eyes fuzzy when I put the glasses on – not a lie, the contact lens practitioner told me the same thing. Finally he relented. I only lost one in the carpet in all those years – flew out of my fingers and into the bathroom contour rug. Do try the monovision – it worked so well. A new place to hide/play ~> PRICELESS! What cat can resist a good fort? None that I ever had! Napping and playing – the perfect combination for a holiday weekend! I love the things that go on in your house and how you make such a good story of everything. I take a nap almost every day, but that’s because I don’t get enough sleep at night. Reading blogs is so much more fun than sleeping. Sometimes I take a nap even if I do get enough sleep at night. Some days are just perfect for sleeping. Like today. Rainy, humid, hot. Wake me when it’s over! You’ve really had the heat this summer. We had only a few hot days, but I can understand from memory that cooler days will be welcome. We really had a lousy summer from a weather standpoint. I like warm weather but the humidity (super high) and almost constant steamy rain can get to you. My tomatoes are giving up the ghost. They have wilt and the plants are dying. I didn’t get the crop out of them that I always get. Most flowers did ok though. That’s good that you got flowers from the lousy weather. I already did and she wasn’t happy. She whined pretty loudly. An afternoon nap sounds perfect! One of my favorite activities especially when it stinking hot out. Yup in this heat wave this summer all I wanted to do was sleep. “Remember to snooze and play” is the best advice ever! I will definitely include both in my day today! Always listen to the cats! Maybe more than a few cat naps. That shot of Mollie is purrfect! And looks like your hubby is starting the weekend off right! 🙂 Have a great one! It’s been a hot week. A little nap on the porch is always good. Yes. It’s Fort Gracie. There was a fee to get inside. She was upset when I dismantled it and put it on the bed where it belongs! I love the shot of Mollie! I’m liking the idea of a snooze, Kate. 🙂 Enjoy the weekend! Another unpredictable weekend weather-wise. Enjoy the holiday!